Congrats to Lindsey LaBella, winner of our $100 giveaway to Ulivo! Thanks to the 100+ readers who entered. 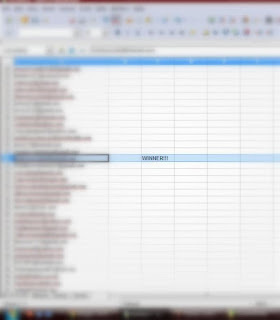 We put all your email addresses into a spreadsheet and used Random.org to generate a random number. Lucky row #32 belonged to Lindsey and now she gets to enjoy an awesome Italian dinner at Ulivo in Queen Village (psst... Lindsey, order the pumpkin angilotti!). Lindsey is also one of our Facebook followers. You can keep up with all our posts, plus a lot more local food photos and links to interesting food news/events by following us on Facebook, Google + and Twitter, too. Thanks again to CityEats for offering to include us and our readers in their Dream Dinner giveaway!